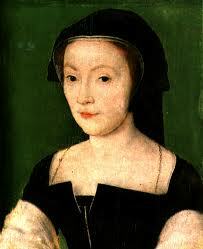 Marie of Guise was born on November 22, 1515 in the castle of Bar-le-Duc in northeast France. Her father was Claude, Duke of Guise and her mother was Antoinette of Bourbon. The Guises were one of the most powerful families in France being very astute in politics and military concerns. They were to dominate Scottish and French affairs for fifty years. Marie was able to learn all the fundamentals of politics from her family. Marie was an only child for four years but then many brothers and sisters came along. When she was eleven, she was sent to live with her grandmother, Philippa of Guelders at her home in Pont-à-Mousson where she was educated. She may have been destined for a convent but her uncle Antony, Duke of Lorraine, while visiting his mother, met Marie when she was about fourteen and decided she should not be shut away. Marie was remarkably tall and attractive, had auburn hair, a regal manner, confidence, dignity, maturity, and intelligence and was affable to all classes of people. She easily inspired loyalty. She would be an asset to the family by making a brilliant marriage, maybe even to one of the sons of King Francis I of France. Duke Antony took her to his palace in Nancy for finishing and when she was sixteen, she was presented at court where she lived for the next three years. King Francis liked her and she became friends with his daughters Madeleine and Marguerite. She was admired for her appearance, wit, prudence, high spirits and wisdom. It was decided in the spring of 1534 Marie was to marry one of three Duke’s in France, Louis, Duke of Longueville. He had extensive estates in Normandy and the valley of the Loire. The wedding took place on August 4, 1534 in the chapel of the royal palace of the Louvre with the King and his family in attendance. The marriage was successful. They lived at court and during the summer they toured around their estates. According to family chronicles, wherever Marie traveled she asked for the names of widows and orphans and elderly people in poverty so she could help them. She visited convents and almshouses, helped children get an education and paid for young girls dowries. Her first son, Francis, was born on October 30, 1535. In the winter of 1536-37 Marie was back at court to witness the marriage of her friend the Princess Madeleine to King James V of Scotland. The celebrations lasted for weeks. Marie returned to her castle of Châteaudun and she was pregnant again. By June of 1537, her husband had died, probably of smallpox, leaving her a widow at 21. Her son Louis was born on August 4, 1537 but he was to die four months later. Shortly before on July 7, 1537, Queen Madeleine of Scotland had died in the arms of King James V at Holyroodhouse in Edinburgh. King James sent word to King Francis his daughter had died and he was seeking a second wife. Francis had no intention of sending another daughter to the cold climate of Scotland and suggested the recently widowed Duchess of Longueville as a possible wife, informing Marie of his plans. She was distressed by the news. Her husband had been dead for two months and she had a young son she would be forced to leave behind to rule his Longueville estates. After being persuaded by her family, in October it was agreed she would marry the Scottish King. About the same time, King Henry VIII of England’s third wife, Jane Seymour had died after giving birth to a son, the future King Edward VI. Henry was looking for a new wife and heard how attractive and tall the Duchess of Longueville was. When Marie heard of King Henry’s interest in her as a new wife and her height, she exclaimed “I may be big in person, but my neck is small”, probably in reference to Anne Boleyn’s comment on her own small neck before her execution. With Marie intervening in the negotiations of her marriage contract herself, she got favorable terms and the agreement was signed in March 1538. A proxy wedding took place at Châteaudun in May. She sailed for Scotland on June 10 and arrived safely. A marriage ceremony in person took place a few days later at St. Andrews. Celebrations ensued. Marie’s influence on James’ court was obvious early on. She was a formidable person in her own right and had many ideas. She influenced how women dressed by wearing French fashion. Marie was able to charm her mother in law, Margaret Tudor, the dowager Queen of Scotland. She coped with and accepted the fact that James had many mistresses and even took care of his illegitimate children. She administered many restoration and remodeling projects on castles. Linlithgow and Falkland Palaces were her personal favorites and she had them remodeled in the French mode. Marie did not become pregnant until Sept 1539 and preparations for a coronation began. The crowning took place on February 22, 1540. A son was born on May 22 and named James. By March of the following year she was pregnant again. During this time her husband was exhibiting signs of paranoia and depression. Marie had a second son Robert born on April 12. On April 21st, Prince James died and shortly thereafter, Prince Robert died too. Both parents were distraught. The children were buried in Holyrood Abbey next to Queen Madeleine. By May of the following year, Marie was pregnant again. In the fall, James learned that King Henry VIII of England was making preparations to attack Scotland and James decided he was not going to allow the attack to go unanswered. On November 24, 1542, James chose to make a huge attack at Solway Moss before choosing the optimal time and place. The results were disastrous for the Scots. The defeat was a huge blow to the King, humiliating him personally and greatly damaging to his forces. He went to Linlithgow to see Marie in her confinement and then travelled to Falkland Palace and retired to his bed with a fever. On December 8, Marie gave birth to a daughter, named Mary. James was to die in the early morning of December 15, possibly of a nervous breakdown. Marie was a widow once again. 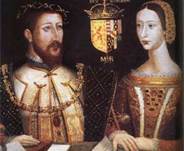 The death of James V and the birth of Marie’s daughter set in motion events placing Scotland in the middle of a conflict between France and England. Both countries wanted to take physical custody of the small princess in an effort to dominate Scottish affairs. 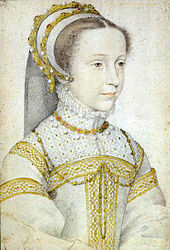 But Marie saw it as her duty to safeguard her daughter’s birthright and to maintain the Scottish alliance with France. James V had no will so the regency of the young princess was to be played out between David Beaton, Cardinal-Archbishop of St. Andrews who was pro-French and the pro-English James Hamilton, Earl of Arran. Arran was named regent and although Marie was in no position to question the appointment, she didn’t trust Arran. He named Beaton as chancellor, two weeks later imprisoning him. He seized all the royal castles except Stirling which was Marie’s by right and began to encourage ties with Henry VIII of England. Henry wanted to dominate Scotland and put forth a marriage of his son Edward to the Scottish Queen. Marie shrewdly agreed to the marriage and the Treaty of Greenwich was negotiated. Marie got the support she needed from Beaton, who had escaped from prison and from Matthew Stuart, Earl of Lennox who was representing King Francis I. Arran agreed to share his position as regent and Queen Mary was removed to Stirling Castle. Marie was to head the council and Mary Queen of Scots was crowned on September 9, 1543. Marie had gambled and won. She was now in control of the government and awaited the annulment of the Treaty of Greenwich. When this did happen, it infuriated King Henry VIII. It was the beginning of a campaign called “The Rough Wooing” which was led by Edward Seymour, Earl of Hertford, King Henry’s brother-in-law. The fighting between England and Scotland lasted from December 1542 to March of 1550. After years of sieges and battles, with power waxing and waning, the English abandoned the fight and a peace treaty was signed. In the meantime, a contract had been negotiated with the French with the young Queen of Scots betrothed to the Dauphin, Francis, son of King Henri II. The six year old Queen left Scotland for France in August of 1548 to be raised by her future in-laws. After the peace with the English, Marie felt secure enough to travel to France to visit her daughter. She mourned the death of her elder son Francis. She then traveled to England and visited King Edward VI. In December of 1552, Marie returned to Scotland and by May of 1553, her power had increased to the point where she could challenge the Earl of Arran. She finally achieved the regency in her own name on April 12, 1554 and was to remain in power until 1560. Her daughter, Mary Queen of Scots was married to the Dauphin Francis on April 24, 1558. During her years as regent Marie promoted French interests, alienating many Scots and those who were in the pay of the English. There was fighting off and on with the English and with the Scottish Protestants led by the “Lords of the Congregation”. Throughout the fighting, Marie would appear before the troops, urging them on and often putting herself in danger. During a round of negotiations to end the conflict in May of 1560, Marie became ill. She suffered from congestive heart failure and was having symptoms of dropsy. Realizing she was dying, she called the “Lords” to ask forgiveness if she ever offended them. Some of them left in tears. The illness became very serious and her mind began to wander. On June 8 she made her will and she finally died on June 11. Her body was taken to France and she was buried in the church at the Convent of Saint-Pierre in Riems. Reblogged this on Stuarts Weekly. Happy birthday Marie of Guise ! A guest biography by The Freelance History Writer. Dear Susan, thanks to Marie Macpherson, I just read your article. Maybe you would like to check my blog dedicated to Mary of Guise: http://marieguiselorraine2015.com. Excellent blog sioban! Fascinating how deep the ties were between Scotland and France. Great post on one of my favorites! I have long held the belief that Mary Queen of Scots should not have been sent to France until she was much older, and remained with her mother in Scotland. Marie of Guise was no-nonsense savvy politician (like her Guise parents, brothers and sisters in France). Marie managed to do all the things her daughter essentially failed to do. Do not get me wrong, I’m a die-hard MQS supporter, but her life in France did not prepare her for Scotland. The Dauphin was always sickly, it could not have been out of their scenario planning that she would one day return to Scotland. Agreed Geri! Mary could have learned a lot from her mother in Scotland. Marie may have felt Mary was in danger of being taken by Henry VIII and felt she was safer in France. It’s also unfortunate Mary was spoiled greatly by the French court while she was there. Extraordinary decision maker and strategist. Agreed Clanmother! I believe Mary Queen of Scots inherited her enchanting charm. I have always been interested in Marie of Guise – she must have been so resilient and adaptable. Imagine leaving your young child behind and marrying someone you’ve never even met, in a strange country… and then sending your daughter away, perhaps never to see her again. I know this was accepted practice in those days, but even so it must have caused so much heartache. And yet she inspired so much respect. Very interesting – thank you! Thanks Jo! I believe you are so right. She didn’t want to leave her children but politics made it necessary. Excellent. I like how your posts are fitting together, taking us up to people we have heard of and filling in with other interesting women. Thanks.